Senate Democratic leader Harry Reid called President Bush "a loser" during a civics discussion with a group of teenagers at a high school on Friday. "The man's father is a wonderful human being," Reid, D-Nev., told students at Del Sol High School when asked about the president's policies. "I think this guy is a loser." Shortly after the event Reid called the White House to apologize, his spokeswoman Tessa Hafen said. Reid spoke with Bush adviser Karl Rove, asking him to convey the apology to Bush, who was traveling in Europe. The Nevada Democrat expressed "regret for the comments, that it was inappropriate," Hafen said. 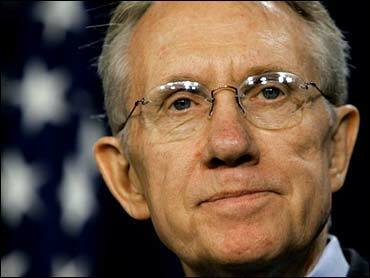 Reid was giving a late speech in Salt Lake City and was unavailable for comment, she said. Asked for comment, a White House spokeswoman referred to a statement issued by the Republican National Committee. RNC spokesman Brian Jones called Reid's statement "a sad development but not surprising from the leader of a party devoid of optimism, ideas or solutions to the issues people care about most." Reid visited the school to discuss Congress and the debate over judicial filibusters. He repeated that the Senate will be brought to a standstill if Republicans change the rules regarding filibusters to hasten the approval of Bush's judicial nominees. Hafen said Reid told the teenagers that if Republicans change the filibuster rules, then they can "no longer count on Senator Reid working with them on the president's agenda."